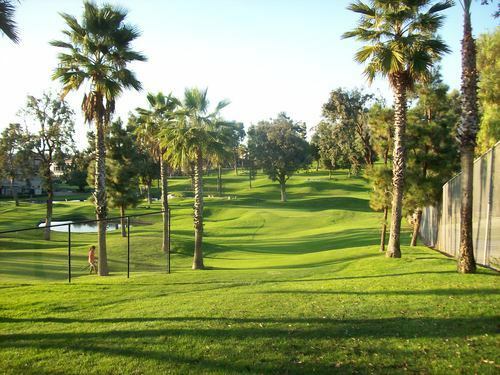 Saturday was another jam-packed “Short Course Blitz” for me as I try and waste no time in checking all of them off my list in Southern California. 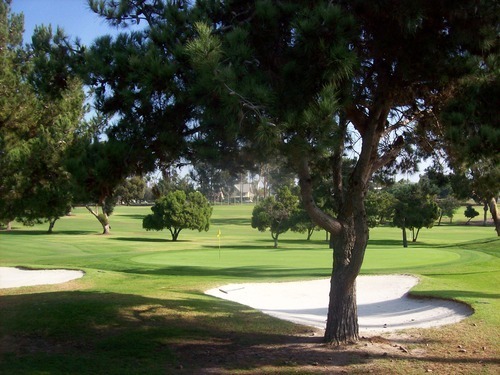 This time I headed to the heart of San Diego and a little bit southward to visit five different courses. I generally like to start each blitz with at least one set tee time and then play it by ear from there. 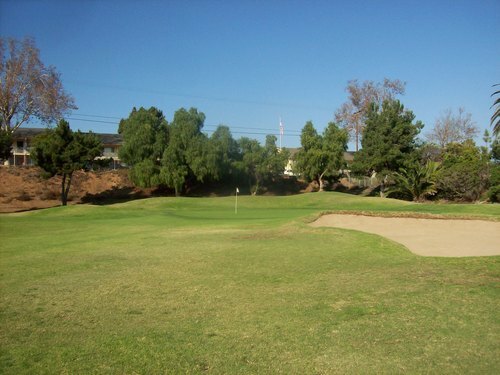 So I booked a 6:04 time at Tecolote Canyon through GolfNow. The price was $23.49 and included a cart, so it was fairly reasonable for a Saturday morning. When I arrived, it was still very dark out and there was also some fog, so it took awhile to lighten up as you’ll see in the photos. There were a few other early birds milling around and the pro shop guy really didn’t give me much direction, so I just rolled a few practice putts and waited for at least a little daylight. While I did that a couple other groups jumped out on the first tee. I teed off closer to 6:15 and then ultimately played through both of those other groups, so I still enjoyed a very quick pace by myself. 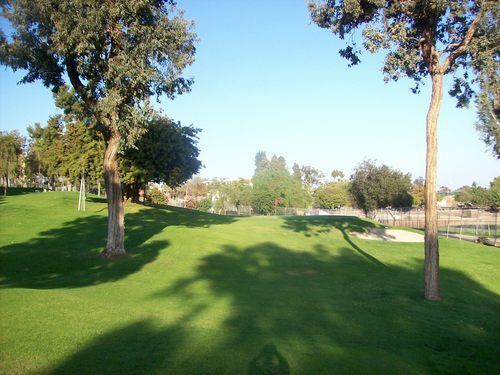 As the name would suggest, the course runs down in a little canyon. 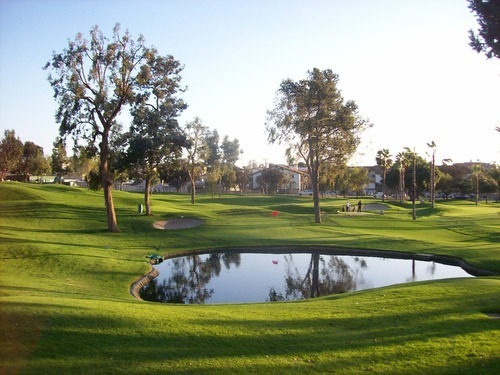 It’s a nice little setting for the course with a small creek running down the middle. 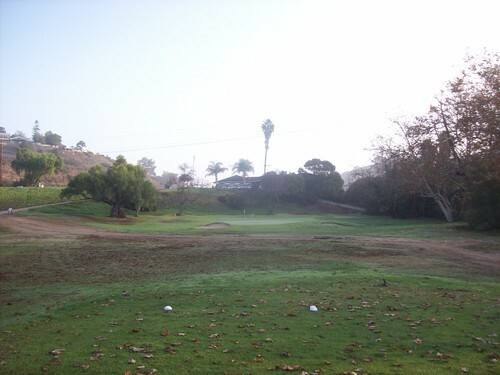 Most holes feature the creek on one side as a hazard and then a hillside on the other to frame your shots and punish you if you hit it way off-line. 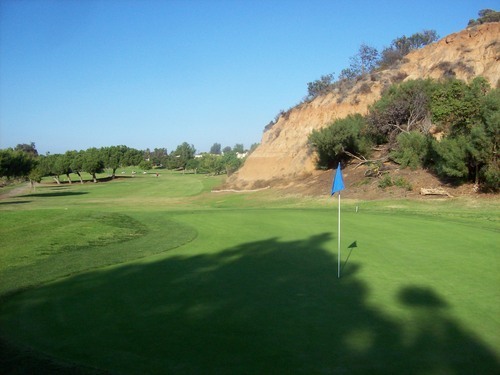 Tecolote Canyon is an 18-hole executive layout with four short par-4s and then a varied mix of par-3s, so you will get to use a number of clubs in your bag during the round. 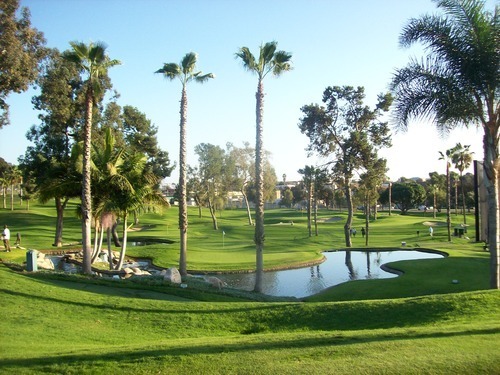 It was apparently designed by Robert Trent Jones, Sr. and Sam Snead, so there is some pedigree in the architecture. I’d say it’s a pretty enjoyable short course for a casual round, but still nothing that inspiring for the more serious golfers out there. 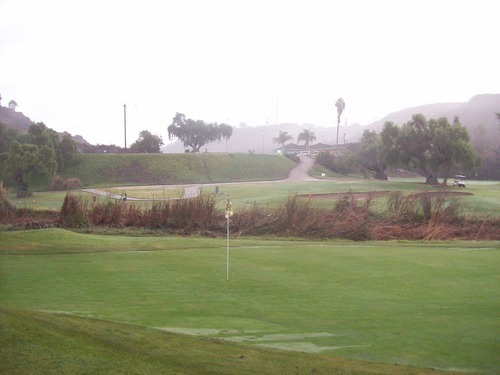 The course was in decent shape, but the rain last week obviously mushed things up a lot. The tee boxes were a bit chewed up, but you can tell they move them around regularly to keep them somewhat decent. 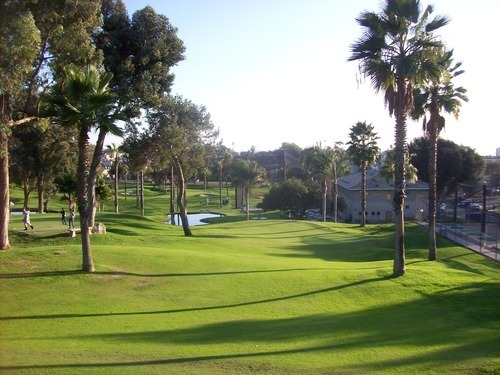 On the par-4 holes, the main fairway landing areas were okay enough. The rough was a lot more spotty, so you never knew what you might get. The one bunker I was in had very good sand. The greens were in very nice shape. As I went through as the lead rabbit, some were mowed and dried, rolling at good speeds. Others were sopping wet and very slow. Once maintenance got to all of them, I’m certain they were all consistently good by mid-morning. 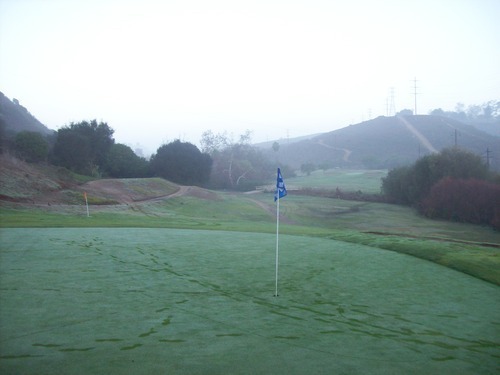 By the time I finished my first round, the fog had lifted to reveal yet another a perfectly sunny San Diego day. 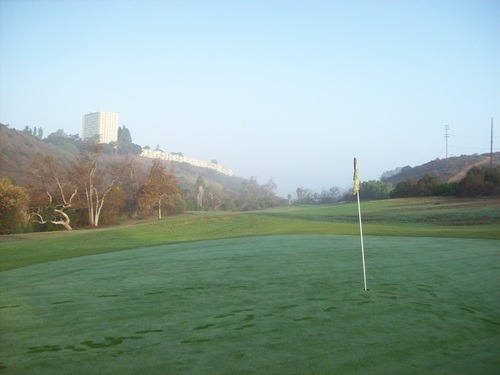 When I arrived at Presidio Hills, which is located right in the heart of Old Town, I was surprised to see literally no other golfers out there on such a nice Saturday morning. Right before my friend showed up, the “crowd” arrived in the form of another twosome who beat us to the first tee. We ended up going off the back nine instead. The price was $12. A few more folks showed up while we were playing, but we never crossed paths with anybody on the course and enjoyed our own relaxed pace. 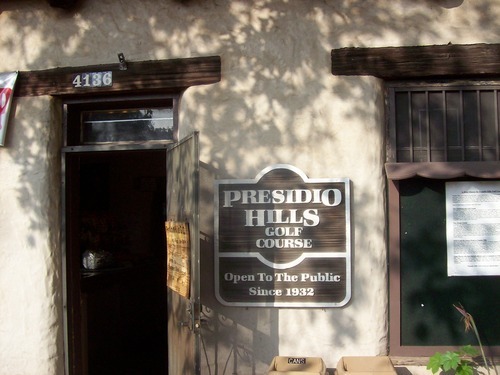 What I didn’t realize about Presidio Hills is that it is an 18-hole course. I knew it was a basic little “pitch and putt” layout, so I guess I assumed it was only 9 holes. 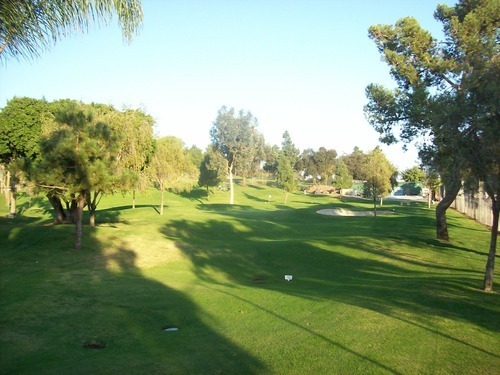 The property, though, is very small and the whole course probably takes up about as much space as an average par-4 on most full size courses! 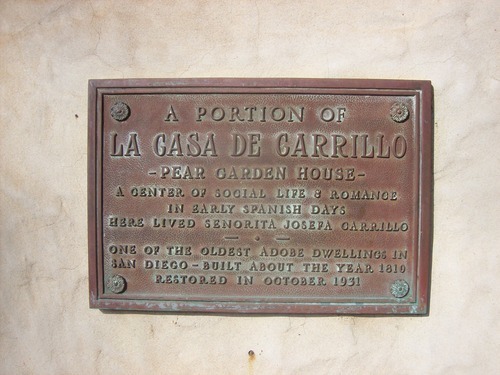 Being in the middle of Old Town San Diego, the course obviously has some history. It’s been there a long, long time and even the pro shop building is a registered historical landmark as one of the oldest standing adobes in town. The course itself is very basic. The scorecard lists the total yardage at a little over 1,200 yards, but it’s probably less than that. 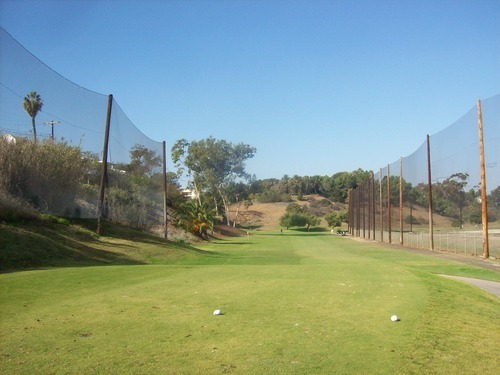 There are a couple holes in the 90-yard range and then there are a few that are more like 40 yards where you just want to hit a little bump and run shot. It’s nice just being able to walk around with your favorite wedge and a putter. The greens are very tiny and harder to hit than you think they will be with such short shots. It really narrows your focus with that small a target. Presidio Hills was in pretty poor shape. The tee boxes were decent as they encourage players to use tees here to keep them from getting too ripped up. 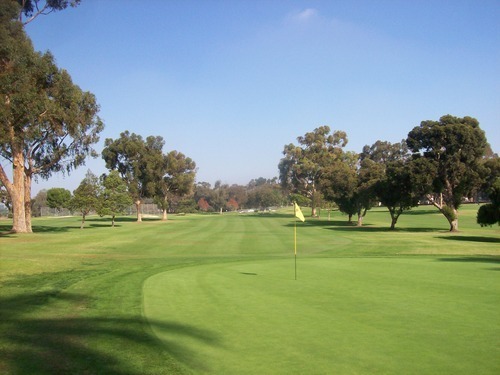 The greens were pretty ugly, bumpy and slow, and according to my friend, usually in better shape than they were Saturday. Everything around the greens was pretty hit or miss, so recovery chip shots were never that easy depending on what kind of lie you found. 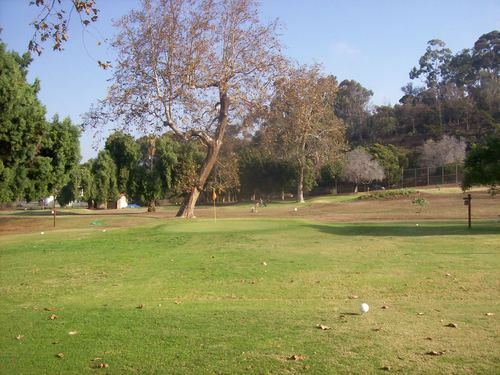 This is a fun course to have checked off the list and there is some charm to it with the history and location. 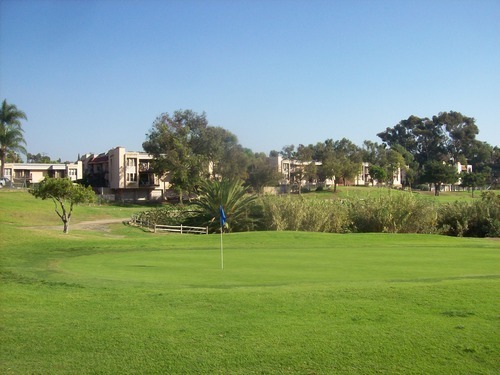 It’s a good place to take your kids for quick, fun and relaxed round, but don’t expect too much. 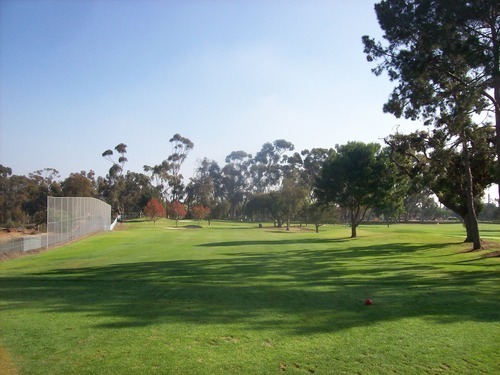 I had the opportunity to play Balboa Park’s 18-hole course last year and I really enjoyed it, but I didn’t end up playing the 9-hole executive course that is also there. My friend is a member of the BP Men’s Club and has been playing Balboa for years and years. Even though he doesn’t play the short course much and hadn’t played it for awhile, it was still interesting playing with someone who knew it so well. We had an 11:07 tee time, but showed up earlier and were able to get out pretty quickly. 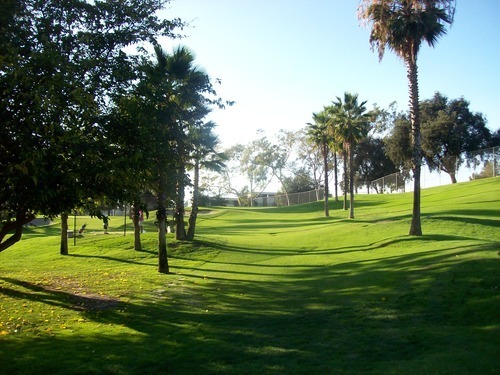 The 9-hole course is definitely a little easier to access than the big course, which is known for always being pretty crowded. As a non-resident, the price for me to walk 9 holes was $23. That’s definitely too steep, but paid what I needed to. Though we got on the course relatively quickly, it was still pretty busy out there and we waited on just about every shot. The pace did move decently enough, though, so we were finished in around two hours. 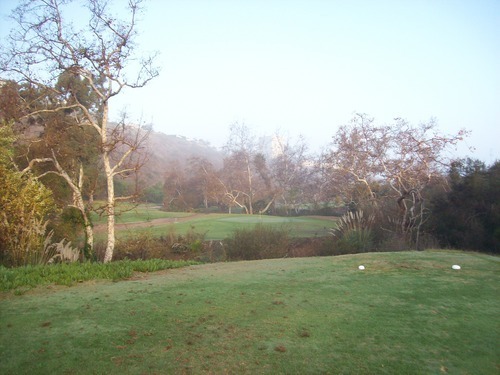 The 9-hole course is definitely a more straightforward old design compared to the more target-oriented 18-hole course that plays along the ridges and through the canyon. 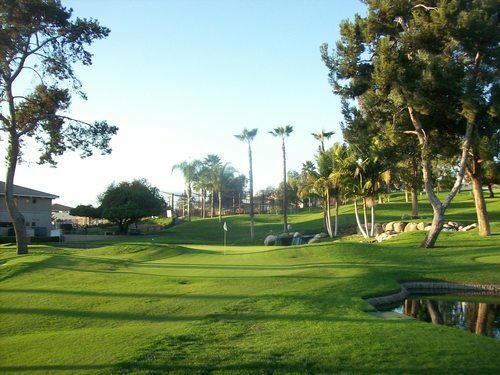 It plays to a par of 32 with five par-4s and four par-3s. 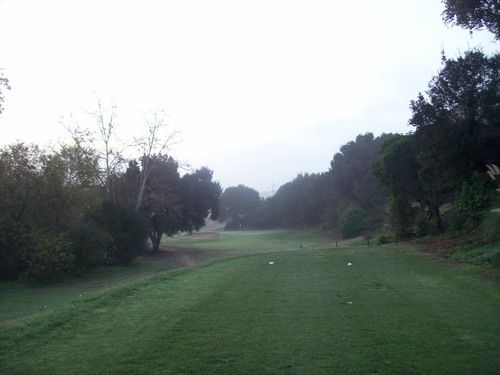 A couple of the par-4s are pretty short, but otherwise the course has respectable length on most holes. The interesting stretch is holes 6-8. The 6th and 7th are drivable par-4s (238 and 218 yards respectively). Both are very good birdie (and even eagle) opportunities. They are followed directly by the par-3 8th, which is listed at 198 yards, but seems just as long (if not longer) than the previous two. A par is a great score on this hole and I really wasn’t too sad about walking away with a bogey there. The course was in nice shape. The tee boxes were good. 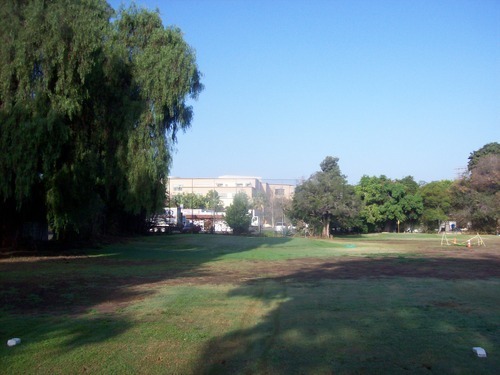 The fairways were mostly great with only a few bare spots here and there. The rough was pretty good throughout. I don’t think either of us was in a bunker, so no comments there. Most importantly, the greens were quite fantastic! 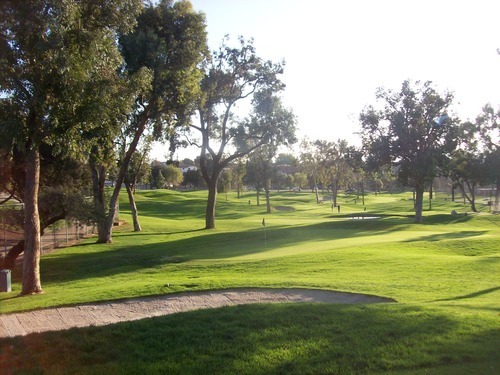 On every level, the 18-hole full course is the one to play at Balboa Park, but for an easier-to-access golf fix for those living in the city, the 9-hole executive course is a good option. 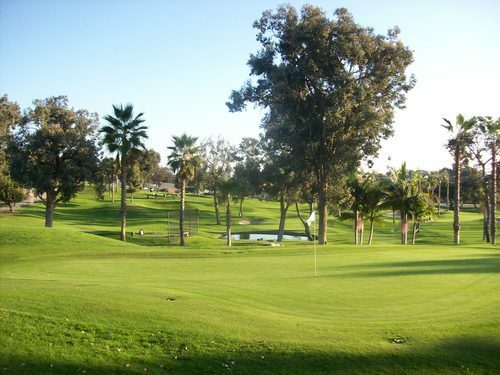 National City is just south of San Diego proper as you near the Mexican border and they do have their own municipal 9-hole executive golf course. It was pretty busy when I showed up, so I knew it wasn’t going to be a super quick round. However, I was able to get out pretty much right away. With a cart, the price was $23. I believe the walking rate would have been $17, so I paid a little extra. I was paired with a twosome and we had fun out there. The course was definitely busy and backed up in a few places, but still moving along at a decent pace. I think we finished in around two hours. That is one nice thing about these short courses. Even the slowest rounds are still not much of a time commitment compared to 4-5 hour rounds on crowded full-length courses. 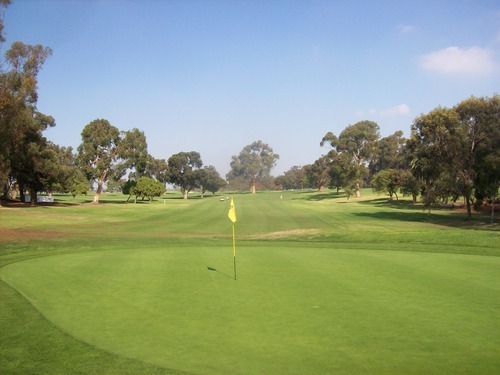 National City is a decent executive course that is just under regulation for 9 holes at a par of 34. 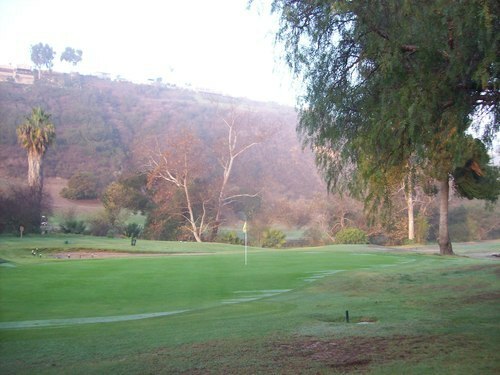 However, the recent rains did do some damage to the 2nd hole. Normally, it is a legit par-5. On Saturday, they had it playing as a par-3. It was no pushover, though. 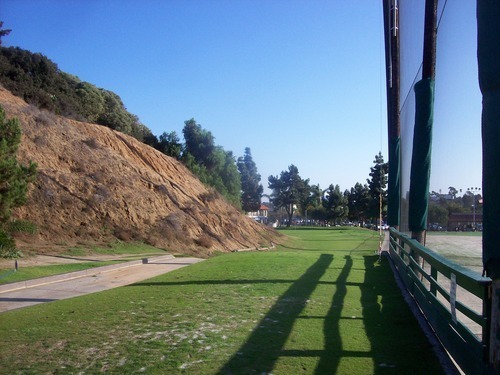 They had the temporary tees set in the fairway at the 200-yard mark with an uphill shot to the green, so it was a beefy hole. That seemed like an odd choice to me. I think they would have been better served (especially considering the average caliber of player here) moving it up to be more like 150 yards as a par-3. 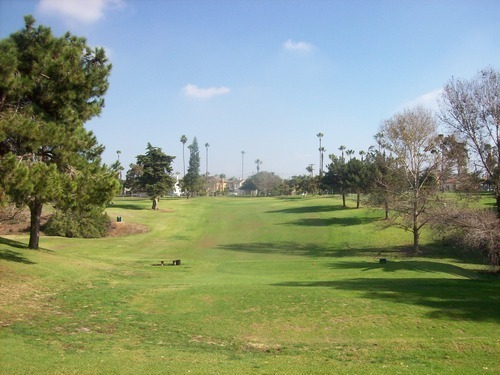 Or, there was enough decent fairway to push it back and make it a 250-yard par-4, which would be pretty consistent with the shorter lengths of the other par-4s throughout the course (anywhere from 240 up to around 300). Otherwise, it’s a relatively fun design going out and back along a small canyon. There isn’t a ton of trouble to get into, but bad shots can definitely be punished with some natural hazard areas and the rugged hillsides. The course was in okay shape. The tee boxes were mostly fine. 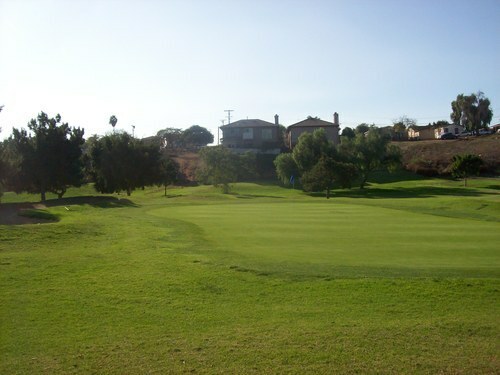 The fairways on the par-4s were pretty good outside of the rain damage on the 2nd that I mentioned. The rough was much more spotty. 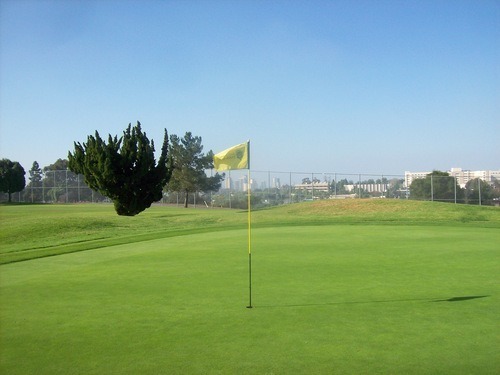 The greens were nice, as well. I was in a couple bunkers and they were also pretty good. Of course, not enough people rake after themselves at a course like this, so that’s always a bit annoying. 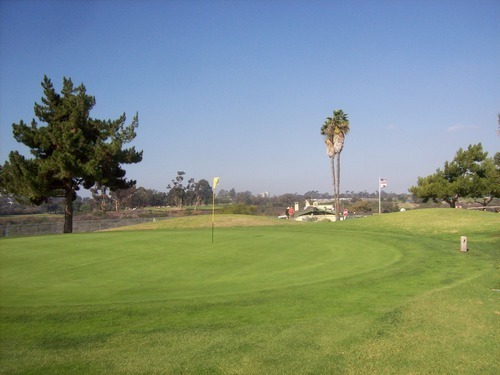 If you live nearby, National City is a decent option for a convenient and casual round. For me visiting from Orange County for the day, it’s definitely a “one and done” experience like most of these short courses will be. Now, this was a pleasant surprise. I’ve already run into several unexpected “gems” during my Short Course Blitzes thus far and this is another really good one. 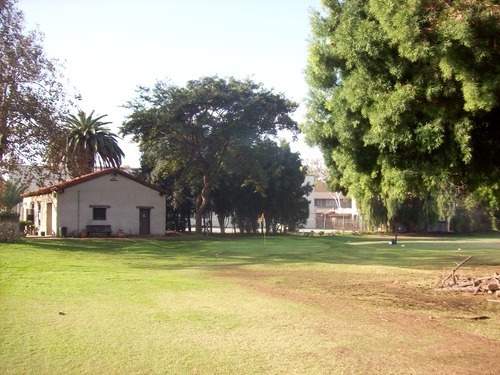 Colina Park is an older facility that was completely redone and beautifully renovated to be the home of San Diego’s Pro Kids and First Tee programs. It is designed to be a learning center for children, where they can learn the fundamentals of the game in a fun and friendly environment. 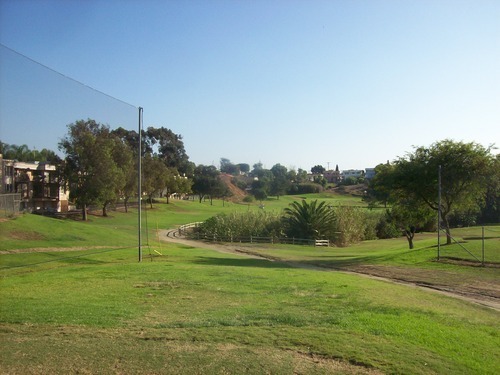 They have a public driving range and the 18-hole par-3 course is also open to the public. There were a lot of kids out there when I arrived around 3:00, but the course was pretty open and I was able to walk right out for a $12 twilight rate. What I didn’t expect was just how nice this little course is. It is definitely what you’d call a “pitch and putt” with only a couple holes around 100 yards and most in the 70-80 yard range. Each hole is named on the scorecard and on the sign by the tee with a different attribute (courtesy, respect, sportsmanship, etc.) to subtly pass on these key ideals to the kids. I thought that was a cute touch. One issue some people might have is that you have to play from mats. However, these are probably the best course mats I’ve ever encountered. They are big enough so they can actually move the tee markers around. They have nice surfaces to hit from. 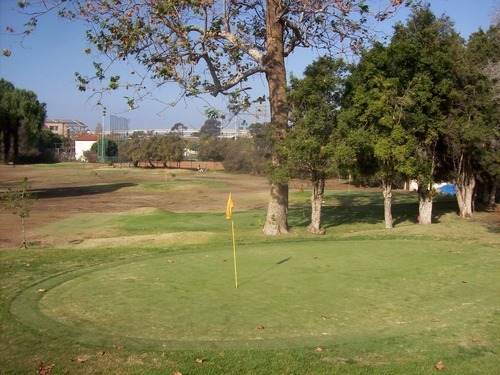 Good players can really trap a wedge and generate a lot of spin while firing at the pins on these short holes. 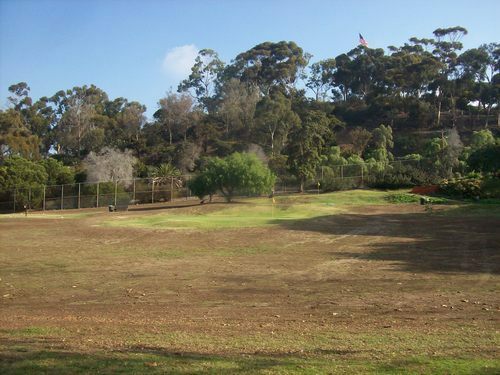 The Colina Park layout is fairly hilly. It is a very small property and the holes are pretty intertwined, but it never felt too cramped. I can imagine if the course was full of kids hitting the balls in every direction, it might get a little crazy. The course was in fantastic shape, which was easily the biggest surprise of all. It was beautiful, green and lush throughout. The greens were soft and there were too many unrepaired ball marks (I guess they are not teaching that piece of etiquette, which is unfortunate). The greens were rolling at pretty quick speeds, though, so that was nice. 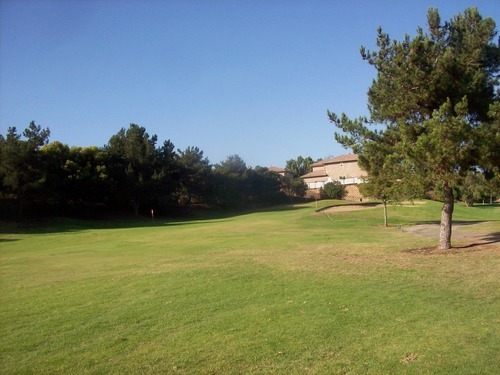 Though similar in philosophy, Colina Park is vastly different than Presidio Hills as there is much more contour and design style in this layout. 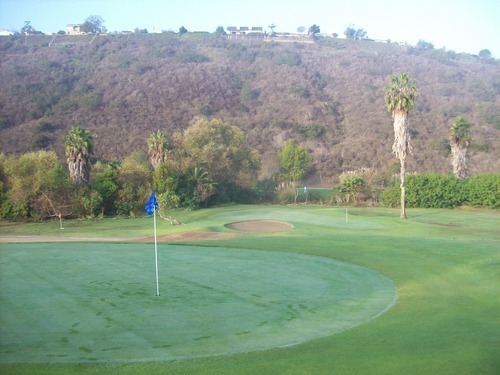 The greens have interesting shapes and undulations and the naturally hilly terrain is complemented by some nice mounding and a few small bunkers. Water hazards come into play on the 17th and 18th holes and there’s even a cool waterfall feature behind the 18th green. 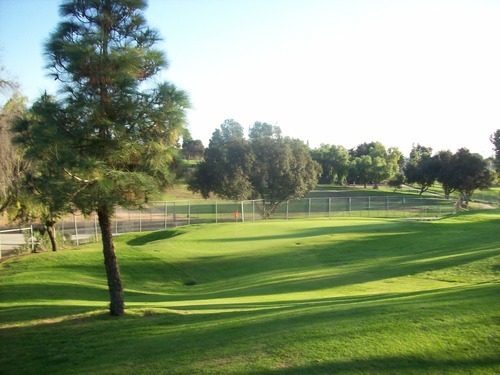 All proceeds from the golf course, practice range and pro shop purchases go to support youth golf programs, so it’s also a place where you feel good about playing. 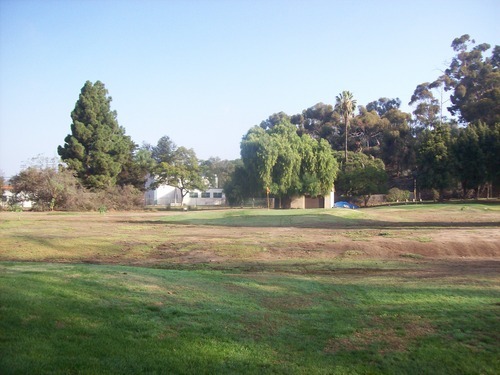 Colina Park is in kind of dumpy part of town and it didn’t feel that convenient as someone not familiar with the area. However, from the amount of kids I saw out there having fun and the great facilities here, it seems like this is a project that is on successful footing.